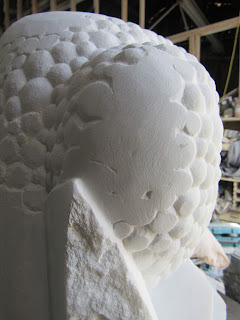 A bit back you may have read some faux-fuss on the unpoppability of stone bubbles. *When the bubble-edge contour line lies parallel to stone bedding, some bubble-like behavior may be observed (i.e. popping). And when that happens, it takes out all proximate bubbles. Like I say, they need each other to exist. Damage control begs the question: How, exactly, do you control damage? It will control you until you're back in control, right?